Sen. Ted Cruz wants to protect taxpayers from political targeting by the Internal Revenue Service. The Texas Republican introduced legislation yesterday making it crime to engage in such behavior as questions still linger about the full extent of the IRS scandal. This is not the first time Cruz has offered this type of legislation. In February 2014, he introduced amendments to the STOP Identity Theft Act. Those measures, however, were defeated by Democrats and did not make it out of the Senate Judiciary Committee. “Free speech is not a partisan issue. The IRS has no business meddling with the First Amendment rights of Americans,” Cruz said during last year’s debate. With a new Republican Senate majority, Cruz is hopeful that this time the language will pass independently as a bill. In a press release, Cruz blasted the lack of action by President Obama and his administration in response to the IRS scandal. 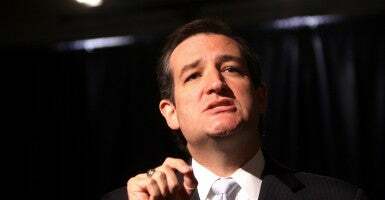 “In May 2013, President Obama declared the IRS’s illegal targeting of conservative groups ‘intolerable and inexcusable,’ yet to this date no one has been held accountable for it,” Cruz said in a statement. Cruz’s bill would make it a crime for any IRS employee to willfully target anyone based solely on political beliefs. Any employee found in violation would be subject to a fine, up to 10 years in prison, or both. “This is a well thought out amendment to the IRS code to try and deter and punish the type of naked political targeting engaged in by Lois Lerner and other IRS employees,” said Hans von Spakovsky, manager of the election law reform initiative and senior legal fellow at The Heritage Foundation. Lerner, former director of the IRS’ Exempt Organizations Unit, left the agency in 2013 after news of the targeting scandal broke. Lawmakers voted to hold her in contempt of Congress last year. Von Spakovsky said abuses like the targeting of tea party and conservative groups should never happen again. “This bill is needed given the unapologetic stance the IRS has taken over its misbehavior and it’s prior history of such actions,” he concluded. Cruz isn’t alone in pushing for a legislative remedy. Today in the House of Representatives, Reps. Paul Ryan, R-Wis., and Peter Roskam, R-Ill., put forward their own plan. Cruz is a Senate co-sponsor of the Ryan-Roskam bill, although it is different from his version. Ben Smith is currently a member of the Young Leaders Program at The Heritage Foundation.